Zakład Mechaniczny (Mechanical works) Mestil Sp. z o.o. would like to express a positive opinion on the cooperation with FF Fracht Sp. z o.o. FF Fracht is our partner in the area of transport and logistics services for international and domestic shipments, oversize freight as well as organization and assistance in resolving logistics issues. We would like to express our satisfaction with the performance of FF Fracht while executing our latest oversize freight job, consisting in a delivery of a press weighing 106 tons, which took place in April 2016 on the route Chesterfield (England) - Gdynia. The service covered a selection of a suitable mean of transport, matching the dimension and the weight of the machine, and the entire organization of logistics under consideration of our needs. An aspect of this cooperation being particularly important to ZM Mestilconsists in a very high level of flexibility, openness and understanding for the needs of us and of our customers. We recommend with full confidence the company FF Fracht Sp. z o.o. as a reliable partner for logistics, primarily for their expertise, which is being combined with their personal involvement in the cooperation and with a commercial sensibility to the specific needs of the customer. We greatly appreciate the professionalism and the reliability of their staff. All this constitutes a great showpiece of the company. We recommend with great pleasure the services provided by FF Fracht Sp. z o. o. to all seeking a reliable cooperation partner. The company FF Fracht ensures fast information flow so that we are kept informed about the status of individual transports. Their services are provided by experienced and polite specialists from both operational and trade departments – these features are necessary for the maintenance of further business relations. The company FF Fracht completes the entrusted projects fully and with total commitment. A great advantage of that company is full availability of its employees who always give maximum support. The employees’ kind and open attitude towards the customer’s requirements encourages to continue the cooperation. Therefore, I highly recommend the company FF Fracht as a professional and trustworthy transportation partner. organisation and assistance in solving logistic problems. During our cooperation, FF Fracht Sp. z o.o. has proved that it is a proven, reliable, and trustworthy carrier and that it deserves to be recommended as a professional shipping partner. 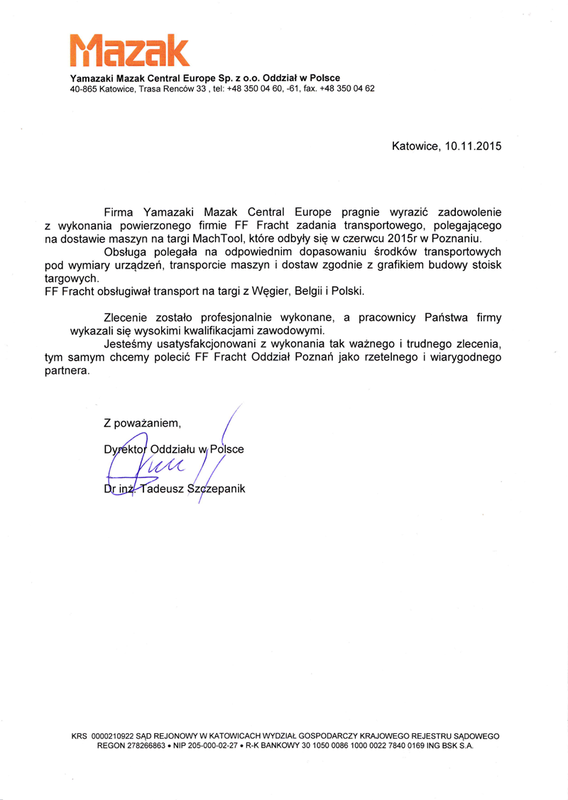 The company Yamazaki Mazak Central Europe would like to express its satisfaction with the completion of the transport order consisting in the delivery of machines for the trade fair Mach Tool that was held in June 2015 in Poznan. The services consisted in choosing the means of transport in which the devices to be transported would fit, the transport of the machines and other cargo in accordance with the schedule for the construction of the trade fair stands. FF Fracht transported the cargo from Hungary, Belgium and Poland. The order was fulfilled professionally and the company’s employees showed high professional qualifications. 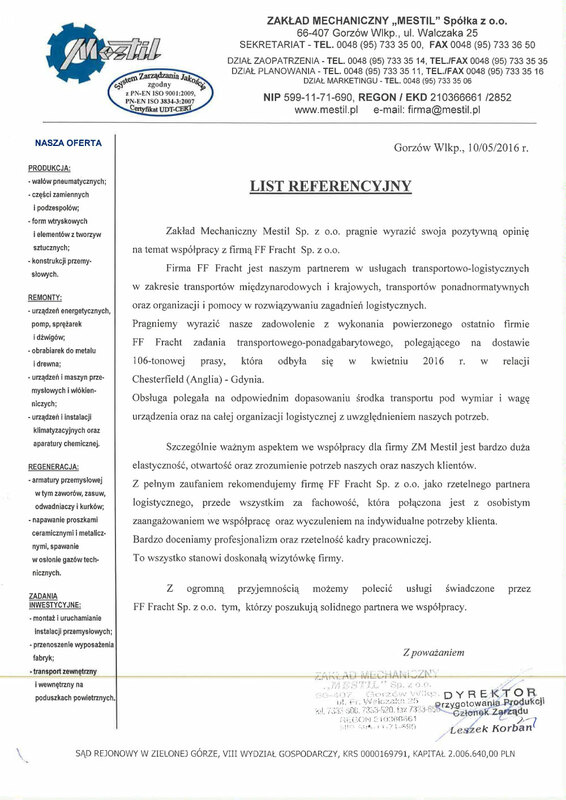 We are satisfied with the completion of such an important and difficult task and would like to recommend FF Fracht Poznan Branch as a reliable and credible business partner. 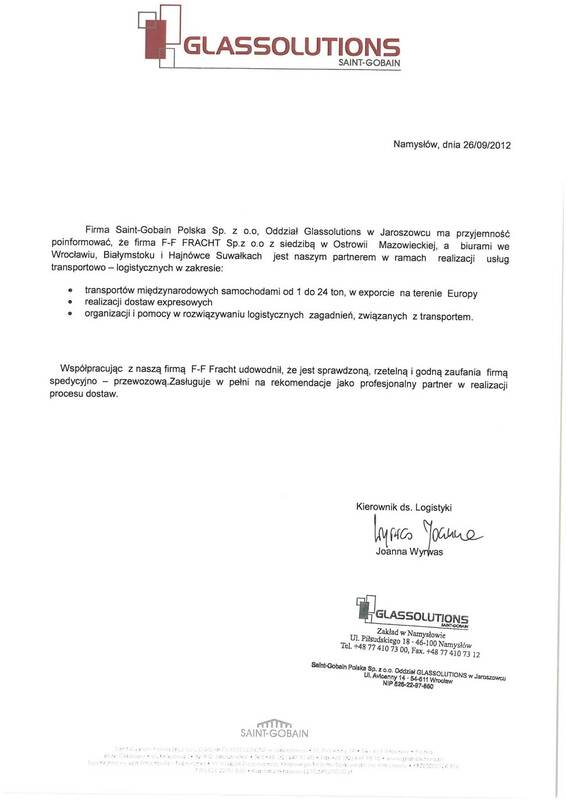 We wish to express our satisfaction with the high quality services rendered by FF Fracht Sp. z o.o. 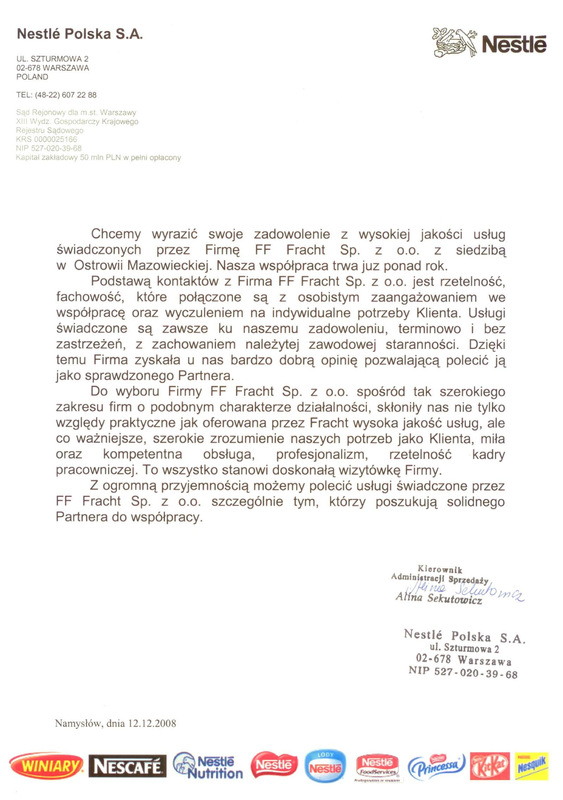 Company with the seat Ostrowia Mazowiecka. Our co-operation has been successfully continued for over a year. The basis of contacts with FF Fracht Company is reliability and professionalism, which are connected with personal engagement in the co-operation as well as sensitivity to individual needs of the customer. The services offered are always to our satisfaction, on time and without any reservation, and with due professional care. Thanks to this the Company gained our very positive opinion, which allows us to recommend them as a proven business partner. We have chosen FF Fracht company from a wide range of companies with similar business activities, not only due to practical reasons as high quality of services offered by the company, but foremost comprehensive understanding of our needs as a customer, friendly and competent service, professionalism, reliability of the staff. All this stands for an excellent presentation of the Company. It is with great pleasure that we can recommend the services offered by FF Fracht Sp. z o.o. Company, especially those who look for a solid business partner. Organization and support in solving logistics issues related inter alia to unloading at 1-18 points. Through co-operation with our company FF Fracht proved to be a proven, reliable and trustworthy transportation-and-forwarding company. It fully deserves to be recommended as a professional partner in completion of delivery process. 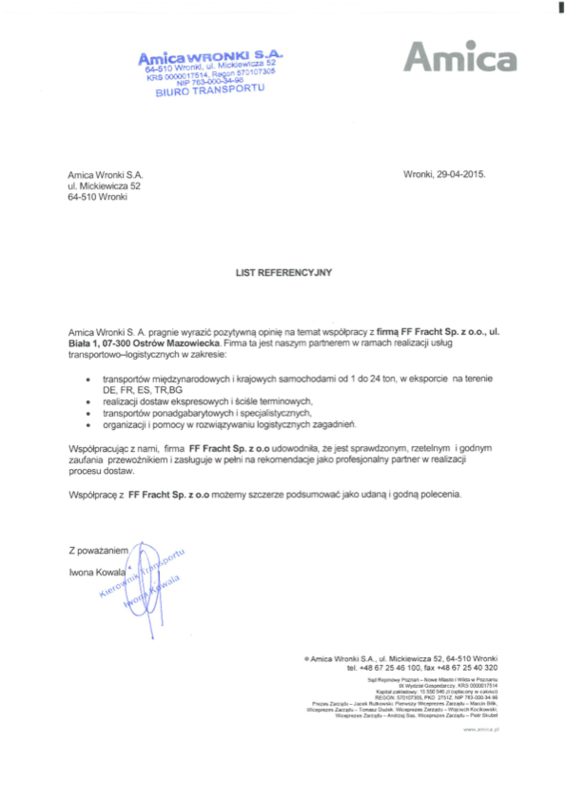 Saint–Gobain Polska Sp. z o.o. Organization and support in solving logistics issues related to transport. Through co-operation with our company FF Fracht proved to be a proven, reliable and trustworthy transportation-and-forwarding company. It fully deserves to be recommended as a professional partner in completion of the delivery process. Completion of other projects within the Group’s business activity, in the scope requiring transport-and-logistics support. 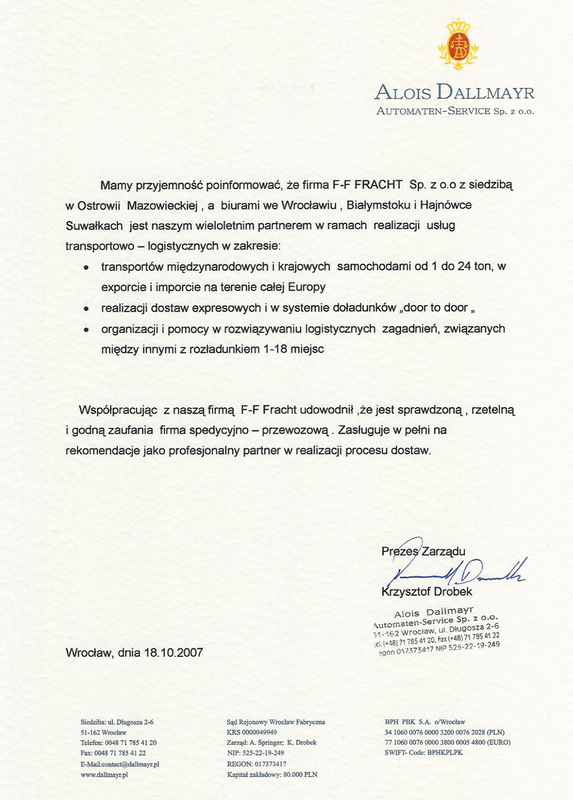 A long term co—operation and dozens of mutually solved problems, completed projects, allow me to distinguish FF Fracht Sp. z o.o. 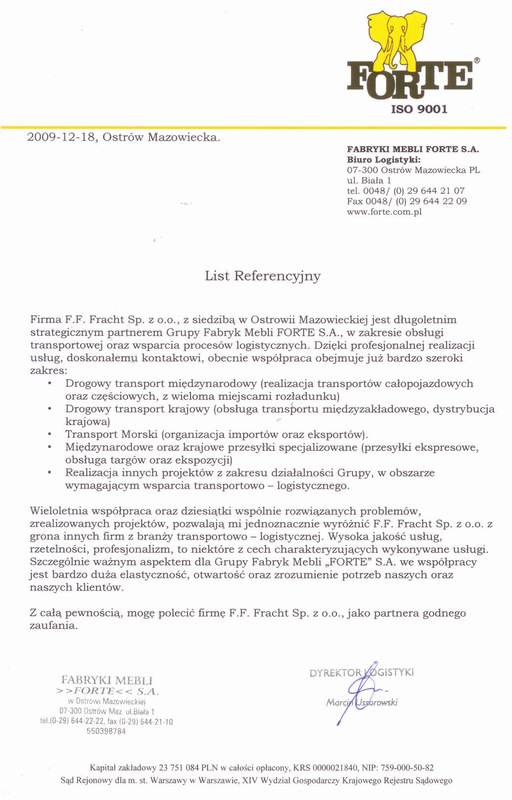 Company from other companies in the transport-and-logistics industry. The high quality services, reliability, professionalism are only some of the features characterising the offered services. A particularly important aspect in co-operation for the Furniture Factory Group "Forte" S.A. is very high level of flexibility, openness and understanding of our own and our customers’needs. With all certainty I can recommend FF Fracht Sp. z o.o. Company as trustworthy and reliable partner.